Why? 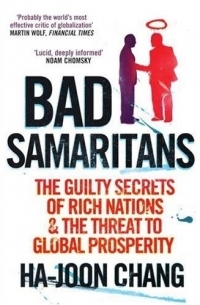 The simple answer is that rich and powerful governments and institutions are ‘Bad Samaritans’: their intentions are often worthy, but their simplistic free-market ideology and faulty understanding of history leads them to inflict policy errors on others. Chang demonstrates this by contrasting the route to success taken by economically vibrant countries with the very different route now being dictated to the world’s poorer nations. In the course of this, he shows just how muddled the thinking is in such key areas as trade and foreign investment. He shows that the case for privatization and against state involvement is far from proven. And he explores the ways in which prejudices about national cultures and political ideologies are obscuring clear analysis and creating bad policy. Finally, he argues the case for new strategies for a more prosperous world that will surprise but may – perhaps – convince the ‘Bad Samaritans’. Lucid, deeply informed and enlivened with striking illustrations, this penetrating study could be entitled "economics in the real world." I recommend this book to people who have any interest in these issues i.e. everyone.